The Togolese love their sports and, although football is the most widely played sport in the country, basketball is rapidly gaining in popularity. 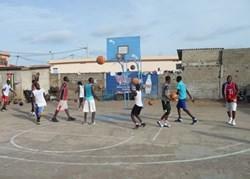 Our basketball coaching programme is based in Lomé. The project allows volunteers to coach basketball to children with a range of sporting talents. Volunteers work at Club Etoile Filante, which has a team that plays in the first division. Training will take place every day from 3–6pm, as there is no electricity on the basketball court for later evening training sessions once it is dark. The team require a mixture of skills, including theory, tactics and general technique coaching. Volunteers coaching basketball work with children and adults aged from about 4 to 35 years old. Your exact role will depend on your experience; if you are able to coach groups alone then that is fantastic, but even by supporting the professional coach you will be a great help. The basketball court is near a big market in town and volunteers usually live about 15 minutes away by car. As most training sessions take place in the afternoons the Basketball Sports project should be combined with a Teaching or Care project in the mornings, to make sure you have enough working hours. Please let us know which combination of projects you prefer when you apply. You can join the Basketball project in Togo for two or three weeks if you don't have time to join us for four weeks or more. This project has been selected by our local colleagues as being suitable for short term volunteering for both the host community and the volunteer. Although you will gain a valuable cultural insight and work intensely within the local community, please be aware that you may not be able to make the same impact as someone volunteering for a longer period.